This was our first cruise on the Oasis, our seventh with Royal Caribbean—overall, it was a very positive experience! We thoroughly enjoyed the itinerary of Labadee, Falmouth, and Cozumel, as well as the days at sea, the latter filled with ample opportunity for both relaxation and busy activity. In terms of onboard entertainment, the ice skating and water shows were excellent. As far as other options, lines at the Flow-Rider and zip line were surprisingly short, although I was turned away from the latter because I wasn&apos;t wearing a sleeved shirt—nothing about this requirement was posted near the ride. A good balance between open play and age-graded competitions were offered at the sports court. As far as logistics and related, embarkation was fairly slow, but disembarkation went much faster. Our cabin location provided quick access to wherever we needed to go, and we received excellent, courteous service by our room steward. Service in the main dining room was, at times, painfully slow (our table often ordered early but was served last), and the food widely varied from average to excellent. Occasionally, crew members throughout the ship seemed preoccupied with conversations between themselves, but this was not the norm. Related, a good number of the crew seemed to speak and comprehend English adequately. Lastly, a change from previous cruises...the highest category of internet service was surprisingly fast, though quite expensive, and the signal carried well throughout areas of the ship. On balance, this cruise exceeded our expectations, and we gladly recommend Oasis of the Seas to you. This was our first cruise on the Oasis, our seventh with Royal Caribbean—overall, it was a very positive experience! 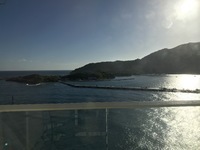 We thoroughly enjoyed the itinerary of Labadee, Falmouth, and Cozumel, as well as the days at sea, the latter filled with ample opportunity for both relaxation and busy activity. In terms of onboard entertainment, the ice skating and water shows were excellent. As far as other options, lines at the Flow-Rider and zip line were surprisingly short, although I was turned away from the latter because I wasn&apos;t wearing a sleeved shirt—nothing about this requirement was posted near the ride. A good balance between open play and age-graded competitions were offered at the sports court. As far as logistics and related, embarkation was fairly slow, but disembarkation went much faster. Our cabin location provided quick access to wherever we needed to go, and we received excellent, courteous service by our room steward. Service in the main dining room was, at times, painfully slow (our table often ordered early but was served last), and the food widely varied from average to excellent. Occasionally, crew members throughout the ship seemed preoccupied with conversations between themselves, but this was not the norm. Related, a good number of the crew seemed to speak and comprehend English adequately. Lastly, a change from previous cruises...the highest category of internet service was surprisingly fast, though quite expensive, and the signal carried well throughout areas of the ship. 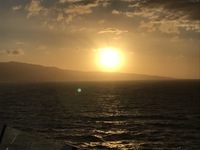 On balance, this cruise exceeded our expectations, and we gladly recommend Oasis of the Seas to you. The location of our cabin provided easy access to the elevators and anywhere on the ship we desired to go. It should be noted that we received excellent, courteous service by our room steward. While the Blue Hole experience (climbing the falls and jumping into the water) was wonderful, the drive of over two hours each way, much of it over bumpy, undeveloped roads, was unnerving. We rented a beach-side cabana and lounge chairs, which made for a relaxing day.